Thursday night's temperature dropped to negative 3 at the Poplar Creek Guesthouse B&B. This marks the first time below zero since last winter! With only a dusting of snow on the Banadad Ski Trail, the below zero temperatures served to freeze the wet spot along the trail. What this means is that when the snow does come it will make grooming much easier. As for snow some is predicted for this weekend although it does not appear to be in significant amounts. Please "think snow" the frozen trails are ready. Yesterday, residents of Little Ollie Lake armed with mauls and picks dug out the illegal concrete reinforced dam blocking canoe access between Poplar and Little Ollie Lakes. The rocks in the dam where piled to the side of the normal water channel between the two lakes and the concrete chipped out between the rocks. Six five-gallon buckets of concrete debris were removed from the site. While residents of Poplar Lake were invited to assist in removing the dam no Poplar Lake residents, accept those with land on both Poplar and Little Ollie Lakes, showed up. According to Cliff Bentley, Minnesota DNR Hydrologist, the dam was clearly illegal and he authorized its removal. The DNR is still searching for the individual(s) who constructed the dam. Now that the outlet has been restored to it natural conditions residents of Little Ollie Lake are hopeful then the outlet will not be tampered with again. According to the DNR it is violation of state law to remove or add any rocks to this outlet. The night of November 18th was still. The temperature dipped into the low twenties. During the that night Poplar, Hungry Jack, Leo, West Bearskin and most of the medium sizes lakes, in the mid Gunflint Trail area, froze-over. Little Ollie, Swamper, Road and the smaller lakes had previously frozen-over over a week ago. The ice was able to set-up the next night as the temperature fill to 14 degrees; a record low for this fall. The larger lake remain open. While there still is a hint of snow on the ground the prospect for the snow remaining or even the lake retaining there ice cover are not good. Tuesday the temperature was in the high forties. The unseasonal warm weather is expected to continue through Thanksgiving and beyond. Members of the North Star Ski Touring Club, a Little Ollie Lake cabin owner and Boundary Country Trekking staff spent two days cutting open the remaining sections of a new ski loop off the south side of the Lace Lake Ski Trail. 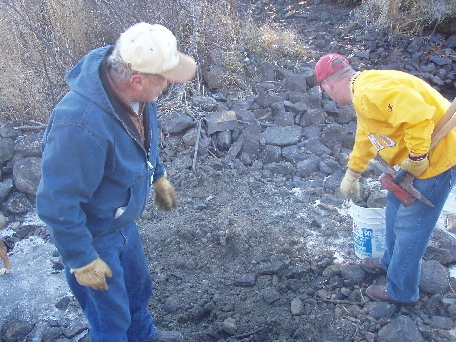 Poplar Creek Guesthouse B&B provided lodging for the club and supervised the trail work. According to trail administrator, Ted Young, "while the new trail is cleared there is still some additional brushing to be completed before the trail will be usable. This new 3.7-kilometer loop trail will allow skiers to ski in and out of the Tall Pines Yurt along a tracked trail from two different directions. Previously skiers had to ski the 1+ kilometers to the yurt along the untracked yurt service road. The trail will also provide another trail option for skiers traveling along the Lace Lake Trail. It is anticipated the remaining work on the trail will be completed in time for the opening of this winter ski season. " With the addition of this new trail loop the Banadad Trail System will offer 43.7-kilometers of tracked trails. The Banadad System is part of the 180-Kilometer Gunflint Nordic Trails. The Banadad Trail System is administrated by Boundary Country Trekking and is open to the general public. The Minnesota Ski Pass is required to ski the Banadad Trail System. The North Stars Ski Touring Club is one of largest, if not the largest, cross country ski clubs in the nation. 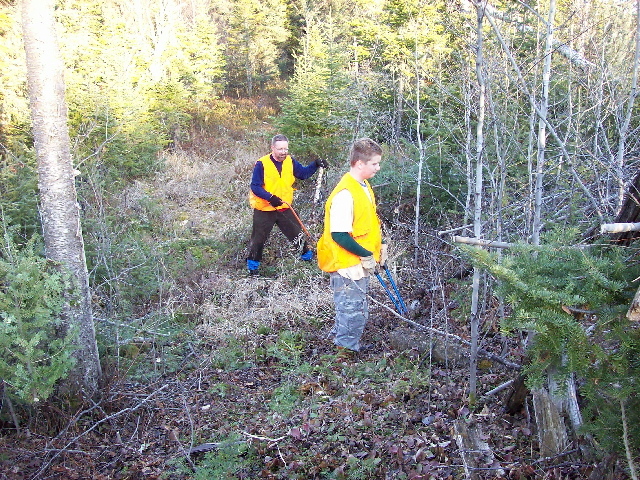 The club has been helping to maintain the Banadad and adjoining Ski Trails for some twenty years. concrete between two peninsulas of land. As of this date the DNR has not been able to determine who is responsible for the illegal construction of the dam. As we discussed, since the dam is illegal and would not have been authorized if a permit had been applied for, it should be removed. 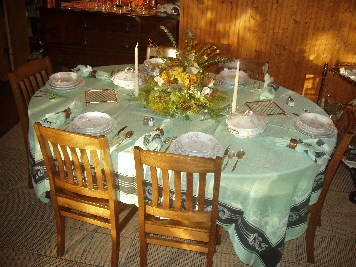 55616phone: (218) 834-6623fax : (218) 834-6639e-mail: cliff.bentley@dnr.state.mn.us." On the strength of this email, several Little Ollie Lake property owners have agreed to remove the dam if the person responsible for it is not apprehended shortly. 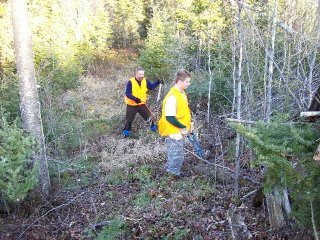 The weekend of Novermber 3-5 volunteers spent two days chainsawing, hand cutting and clearing a one and one-half kilometer trail connecting the Lace Lake Trail to the Tall Pines Yurt. Perviously skiers had to travel along the un-tracked supply trail to get from the Lace Lake Trail or parking area to the Yurt. According to Ted Young, trail administrator, "this new trail is the first section of a planned 3.75 kilometer loop trail. Hopefully we will complete the entire loop in time for next winter's ski season." Interested in winter silent sports? Looking for something interesting to do this winter or a place to cross country ski, snowshoeing or dogsledding? Mark your calendar and join us at the Midwest Mountaineering's annual Winter Expo. We have a booth at the show and we will be providing information about cross country skiing on the Gunflint Trail's famed Banadad Ski Trail including Yurt to Yurt and Lodge to Lodge Skiing, base skiing at the Poplar Creek Guesthouse B&B and Tall Pine Yurt, great snowshoeing, dog sledding and more! We will also have exciting information about our new luxurious ski-in rental cabin- "Poplar Creek Retreat" which will be available for rent in January. Winter Expo is scheduled for November 10 through 12 at Midwest Mountaineering's Store located at 309 Cedar Ave, Minneapolis, in large tents erected behind the store. We would love for you to stop at our booth to say hi! If you are unable to attend the show and/or would like more information about all the Adventure Vacations we offer, click on Adventure. For information on our Secluded Gunflint Trail lodging, click on Lodging. You can also call us at 800-322-8327.